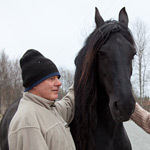 Ramshyttan Horse Farm is situated in the beautiful natural surroundings of the Kilsberg hills, about halfway between Stockholm and Gothenburg – a semi-wilderness area of lakes, forest and prolific wildlife. We are engaged in small-scale breeding of Icelandic and Friesian horses as well as offering trail rides, courses in horsemanship, accommodation, and access to a wide variety of outdoor activities. Besides riding through magnificent Nordic landscape, visitors to Ramshyttan can enjoy hiking, swimming, canoeing, fishing, bird watching, mushroom & berry picking, and in winter, cross-country skiing through pristine forest terrain. All of us involved with the horses on the farm try to follow the principles of Natural and Holistic Horsemanship. For us this these concepts have a broader meaning than the associated handling and training techniques, it means giving our horses a way of life that is as close as possible to their wild, natural state, whilst still having the comforts and benefits made available to them by humans. Our horses live as a herd outdoors with free access to bedded shelter when they please, they can feed around the clock at their own pace with free access to grass and hay which creates a healthy metabolism and balanced approach to food. We have also chosen to keep our horses barefoot, allowing the hoof and leg circulation to remain unhindered thus promoting stronger, harder hooves and sure-footedness. For us keeping horses this way is not only a philosophy, it is a practical way of ensuring that our horses remain as happy, stress-free, well stimulated and harmonious as possible. Roland is in charge of the farm in general and is more than happy to take care of all things that give him an excuse to drive his tractor - and fortunately there are many. Otherwise, Roland has a background as a journalist and teacher at the university where he still is active by project. Marie has had Icelandic horses for nearly twenty years and among many other things she is responsible for the trail rides on the farm. As she has practiced orienteering most of her life, she knows the surrounding forests of Ramshyttan like the back of her hand. Aleah has had a passion for the Friesian breed of horse since she was a child , and can probably be considered responsible for the farm heading in that direction... Otherwise, Aleah is a singer and a professional photographer, interested in holistic therapies, meditation and animal communication. 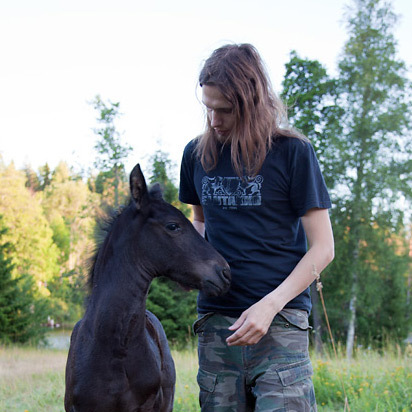 Metal Guitarist and full-time musician who unwillingly has become a stable hand in between tours ... Indispensable in the winter when the horses need fresh water daily, grooming or extra feeding, when wood needs c utting or there are other tasks where an extra pair of hands are required.